© 2018 Simulation Lab L.L.C. All rights reserved. In the assembly management window you can graph and connect nodes based on the order you want them to be disassembled. Green Plus button: Adds the selected node (in the 3d scene) to the disassembly diagram, if a disassembly graph node is selected, it will become the parent of the newly added node. 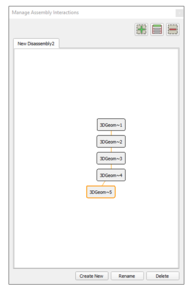 Ladder button: Change parent of selected disassembly graph nodes, a graph node must be selected before clicking this button, the graph node selected afterwards will become the new parent - or - if a blank space is selected, the graph node will become independent (with no parent). Red Minus button: removes a node from the graph. Create new: create a new disassembly diagram. Rename: change the name of the disassembly diagram. In the tutorial video below, you can show how used disassembled group.